I’m in Heaven!! 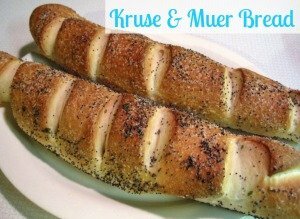 Kruse and Muer Bread!! I love the bread from Kruse & Muer. Love is probably an understatement. When I was a senior in high school, we were allowed to leave campus for lunch. We would leave school and wait outside the doors of Kruse & Muer until they opened. We would get 2 loaves of bread and then manage to eat it all on the way back to school. Yes, lunch would be just bread, but it was so worth it. Since I’ve recently been trying out making bread on my own, I searched online for this bread and found it. I tried making it once using pizza dough but it just wasn’t the same. It was still good bread and we used it like breadsticks and dipped the bread in pizza sauce. This time I followed the whole recipe. I modified it just a little – there was just too much salt (and that’s coming from someone who loves salt). The original recipe is on What’s He Cooking Now? and The Cupcake Forest. I actually merged these recipes – they are almost the same. Dissolve the active dry yeast into 1 1/2 cups water. When the yeast starts to bubble (about 5-10 minutes) add sugar, olive oil, and salt and mix. Add the bread flour into the liquid mixture on low speed using the kitchen aid. After everything is combined, knead the dough for 5 minutes using the dough hook. Then place the dough into a lightly oiled bowl, cover it, ant led it sit for about a half hour. Unwrap dough and roll it into four loaves. Then roll the loaves into the sprinkle mixture. Move the loaves on to a baking sheet covered in parchment paper (or silicone mat). Using kitchen scissors, make 5 snips equally spaced. Brush each loaf with the oil blessing (I sprinkled a wee bit more of the sprinkle over the loaves) and wrap the tray of bread in plastic wrap. Let it sit for a half hour. Bake for 10 minutes at 450 degrees, then lower the temperature to 400 and bake for another 10 minutes or until golden (it ended up at 5-6 minutes in my oven). Enjoy warm! I even add a little butter, yum! By the way, Kruse and Muer On Main is where my hubby proposed to me. It was (okay, probably still is) my favorite restaurant. I wish we lived closer. Hmmmm. Maybe an idea for a date night? It’s not too far of a drive. Are you listening hubby? Yum!! Is it as good with out the poppy seeds? 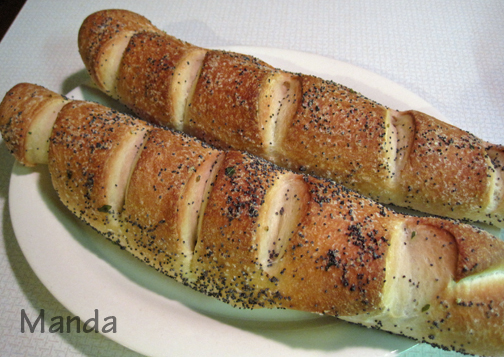 I would think that it would be okay without poppy seeds, but I love them there. This was wonderful! 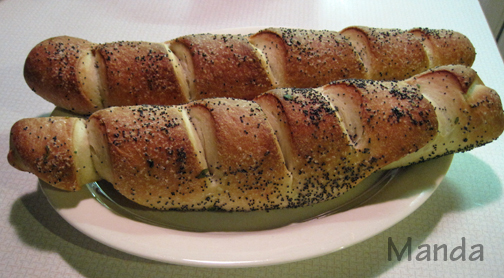 I made it today and it really does taste like Kruse and Muer’s bread – yum! By the way, Jessie tried making it w/o poppy seeds and said it was still delicious. Thank you for sharing the recipe! Great recipe – one of my favorites (and the most popular on my blog.) I agree with you – too much salt. I usually cut it down, but included the original proportions just for authenticity. Love the photos – your loaves look great. Thanks for the link!